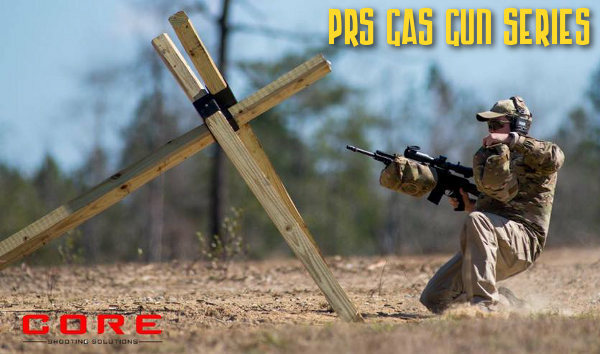 The series-opening PRS Gas Gun match is in the books. Ryan Castle put on a fun match to help set the tone for what this series will become. 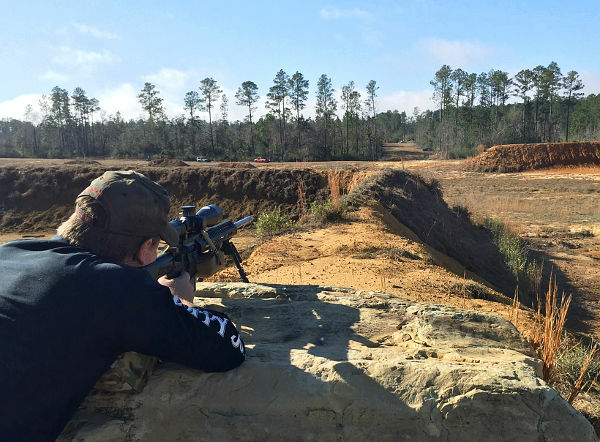 There were plenty of challenges for both the PRS and 3-Gun competitor. The best way I can explain it is to go as fast as you can because time matters, and then don’t miss because the penalties for leaving targets are harsh. I am looking forward to shooting more of these matches and would encourage any of my PRS and 3-Gun friends to give one a try. Congratulations to the USAMU’s Tyler Payne (right) for the exhibition on how to shoot this and a very commanding overall win. 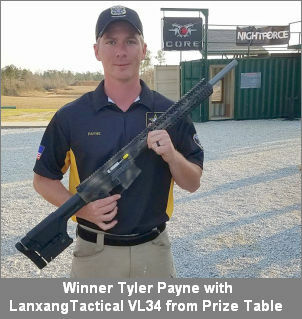 [Payne won overall and high military with a score that was 25% higher than the next-best finisher.] Also congrats to Rhett Walters and Terry Cross for their first-place and second-place finishes in Tac Lite (and 2nd/3rd overall). I was fortunate to place third in Tac Lite and 4th overall for the match. Thank you to FALKOR Defense for the prize table contribution. Squad 4 was a lot of fun and I was fortunate to shoot with some of our nation’s finest warriors and competitors. It was great to see various military guys in attendance refining their craft. It was great as always to see all of my friends at the match and make new ones. While I love shooting, the people are why I keep coming back. 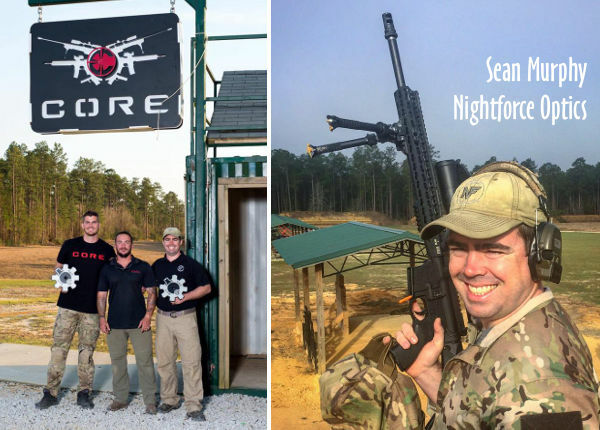 I was proud to see Nightforce Optics well represented on guns, with the ATACR 4-16×42 F1 seeming to be a solid choice for many competitors. My optic of choice is an ATACR 16x F1 with a Horus H59 reticle. For this style match the magnification range, Zero-Hold adjustment and wide field of view are a perfect combination. We had some smoke roll in from area fires on Sunday, and the ED glass was an aid in finding the targets in deep haze and shadows. Because of the time component [stages are “on the clock”], being able to shoot with holdovers is key, as well as being able to make fast corrections on follow-up shots. The H59 or TReMoR 3 will be strong contenders for this. I shot a 20″ PROOF Research carbon fiber-wrapped barrel that was expertly installed by Greg Hamilton himself. It shot lights out while keeping the gun light and handy for movement and getting in/out of multiple positions. While I like the Geissele Automatics, LLC Super 3-Gun (S3G) trigger for carbines as it’s really fast, I went with their DMR trigger for a more refined break that helped on the 600-800 yard shots. My ammunition of choice for this match was Black Hills 77gr .223 Rem. The ammo shot outstanding, especially at longer ranges. I believe the long-term solution may be to find a light and fast load for closer stages for near instant reaction time and use a heavy load for the long shots to see splash and get the target to move a little more. The .223/5.56 guns had some lag time waiting on shot impacts, so finding a way to speed that up over 20 or so shots might save a few seconds per stage. I continue to love my Kestrel 5700 AB. It was very confidence inspiring to show up at the range, get my atmospherics and run accurate data to get first round hits all the way to 800 yards. The precision rifle game seems to require an assortment of bags and other gear for the various shooting positions to conquer. My Armageddon Gear and Wiebad bags and gear continue to deliver and hold up to much abuse. Tactical Light Division: Intended to allow competitors the opportunity to compete using traditional military and law enforcement caliber. This promotes Active Duty military and law enforcement competitors use of their Service and Department-issued rifles. Tactical Light Division rifles are restricted to 5.56 NATO/.223 Remington calibers only. Bullet weight cannot exceed 77 grains and muzzle velocity cannot exceed 3,000 fps. 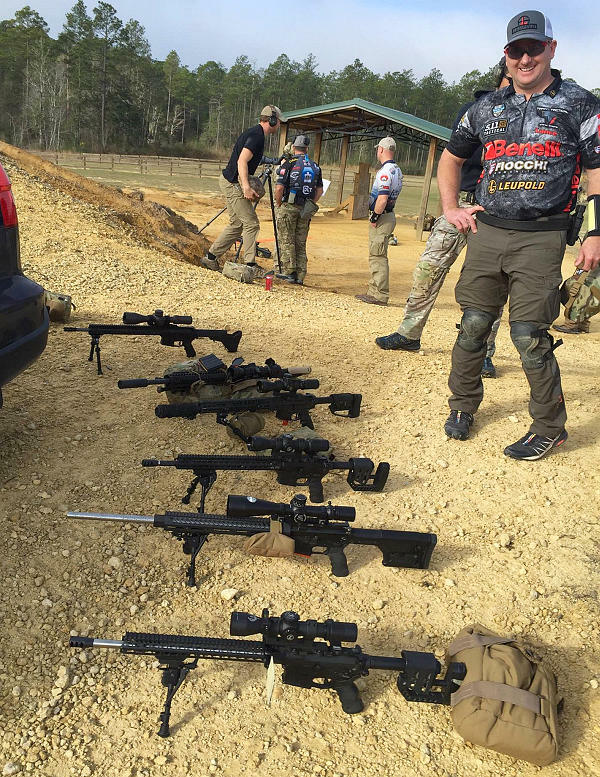 Share the post "PRS Gas Gun Match — Season Opener in Florida"
Really? I just did a little checking with the JBM calculator and the Hornady loading manual. Assuming you’re running a 55 grain VMAX with a (max allowable) muzzle velocity of 3000 fps your bullet gets to 100 yards about .009 seconds faster than a 75 grain BTHP launched at 2700 fps. So you might gain about one hundredth of a second per round by running a faster lighter bullet. Over 20 shots that’s around .2 seconds. I doubt I could detect that .01 second per shot difference. Call me crazy but there should be easier ways to make up less than a quarter of a second over the course of a match than to carry two different kinds of ammo just for this purpose. Editor: What I think Sean was saying is that the lighter bullets were not rocking the distant steel targets enough, or displaying enough splash… hence time was lost confirming a “hit”. I think he’s saying continue to use light bullets close, and heavier bullets far.